When we first shared the new SmartCab kitchen cabinet storage system from Häfele on Pinterest, it got a lot of love, to the tune of 6 likes and 16 re-pins. Known more for their cabinetry hardware, Hafele is offering a storage solution that can fit into virtually any kitchen design. 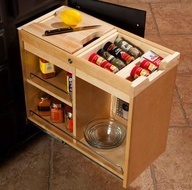 The SmartCab system is designed to maximize the use of those narrow cabinet areas in your kitchen. They are designed to fit into 15- or 18-inch cabinets with a drawer above the door, as is the case with standard base cabinets. Hafele’s SmartCab can be customized to be able to store a wide variety of household items. Whether you need a handy place for your cutting boards, or a spice organizer, or somewhere to keep your foil and wrap rolls, the SmartCab system can offer a solution.